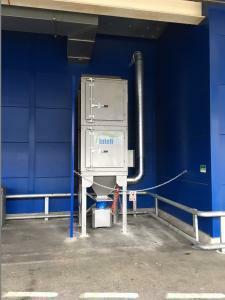 Through our partnership with Space Engineering, our sister company (WAD) was approached by IKEA to design and install a new dust extraction system for IKEA’s wood working works shop within their site in Southampton. During IKEA’s own investigations their small wood working shop was being required to be used more frequently by their resident carpenter, so to enable to provide the best levels of protection they felt it was necessary to install a dust extraction system to remove potentially harmful, airborne dusts. Although the workshop is relatively small and only occupied by a single operator, due to positioning of the workshop within the larger building layout, and the need to ensure that access is not restricted and space not taken up the design of the system had to be carefully thought through. Due to the nature of the work the resident carpenter carried out, it was felt that 2 off flexible 3m arms would provide pin point extraction wherever it was required within the workshop, but due to the space restriction anchoring of these arms would not be possible from the floor or the walls. The solution to this was to anchor the arms using rigid stands from the ceiling, although the ceiling was 20ft high it was of a concrete construction that made this possible to do. For this project Western Air Ducts installed their Inteliair I20 shaker unit, which provides a neat compact system, which in turn provides sufficient amount of air with a convenient self-cleaning system with waste collection into a bin on wheels for easy disposal. The unit was housed externally, but with the erection of an “IKEA blue” screen helped to blend the unit into the building design. Over all the installation took 3 days and the finished project was greatly received by both Space Engineering and IKEA.